AT&T has virtualized more than half of its network within the past three years by rethinking how networks are designed and built. Great explorers do more than just venture into the unknown. They also bring back maps and guides to show others the path forward. In 2014, AT&T embarked on a journey to rethink how networks are designed and built. Network traffic soared due to smart phones and mobile device popularity. The old network model couldn’t keep up. Throwing more network gear – switches and routers and other bulky devices – at the problem was inefficient and expensive. Software was the only way forward. Most consumers were already making the hardware-to-software switch. Think of how you’ve replaced your cameras, music players and video game systems with apps on your phone. We decided to do the same thing with our network. We turned our routers, switches and firewalls into software apps running on standard servers. It was a first for the telecom industry and the wide area network. It was a difficult expedition into undiscovered territory. But we pulled it off. Now, we are well on our way towards our goal of virtualizing 75% of our network by 2020. We hit 34% in 2016, and aim to hit 55% this year. Getting there isn’t easy. And we know many companies don’t have the resources or the time to recreate our path. So we drew a map. We recently published a book that serves as a guide to help service providers and other tech companies build their own software-defined networks. 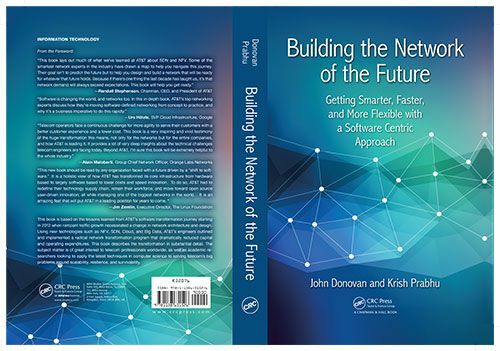 It’s called “Building the Network of the Future: Getting Smarter, Faster, and More Flexible with a Software Centric Approach.” All author proceeds from the book will go to charity. And you can enter a discount code for 20% off at CRC Press’ site. Enter BWR18 , and they offer free standard shipping. The detailed technical blueprint shares valuable lessons we learned on this journey. And it’s receiving some high praise. While the book is intended for a technical audience, it’s an important marker on the network journey both consumers and enterprises are on. Congratulations to several of our experts from across the AT&T Technology & Operations organization who wrote specific chapters of this book. It’s a software-defined world now. And we’re helping to light the frontier just a bit.